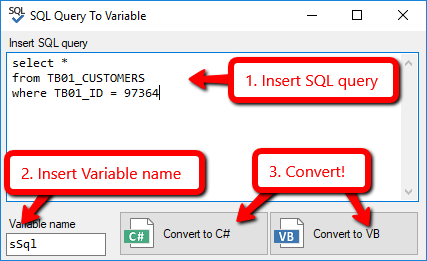 SQL Query to Variable is a Visual Studio Extension to help developers to transform SQL query in Visual Basic or C# variable. #SQL Query to Variable The SQL Query to Variable is a extension for Visual Studio development platform. It is a Visual Studio Extension to help developers to transform SQL query in Visual Basic or C# variable. #Example to use After installation find "SQL Query to Variable" in "Tools" of Visual Studio. In the text area put your SQL query. 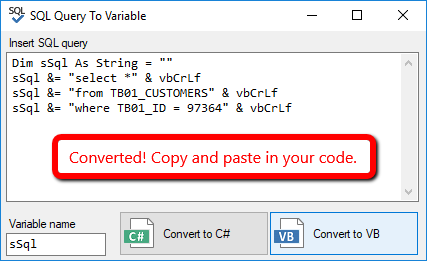 Click for convert in C# or VB. Copy and paste in your code. #Free to use You can use this extension, it's FREE!